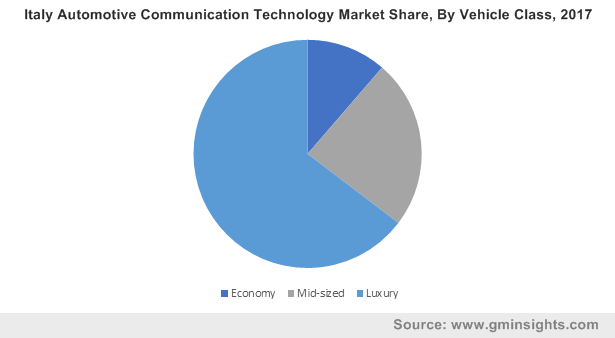 Automotive Communication Technology Market size was estimated at over USD 7 billion in 2017, growing at a CAGR of over 14% between 2018 to 2024. The automotive industry has evolved rapidly over the past decade with the rising usage of Electronic Control Units (ECUs), which have positively influenced the way various automobile subsystems communicate. These automobiles have a large number of sensors, wires, and circuits with enormous dedicated wiring, leading to bulky, complex, and expensive wiring harnesses. This has led to the adoption of automotive communication technology as they provide higher bandwidth, security, determinism, and fault tolerance capabilities, reducing circuit complexity. The growth in the demand for automotive electronics plays a vital role in the rising demand for automotive communication technology market. The electronic systems assist in meeting the safety regulations such as adaptive cruise control, blind spot detection, and lane chase assist, encouraging manufacturers to incorporate these systems into their vehicles. All these subsystems are connected to the central gateway through various bus modules including CAN, MOST, and Ethernet, enhancing in-vehicle communication and safety. The powertrain, chassis, safety, infotainment, and body comfort are the major applications that use the automotive communication technology due to which car manufacturers have increased the adoption of in-vehicle electronics, in turn augmenting the automotive communication technology market growth. The Ethernet bus module is expected to grow at the fastest rate in the automotive communication technology market at a CAGR of over 17% over the forecast period. Ethernet technology has introduced advanced features in the automotive industry, driving its market growth. The major benefits offered by the Ethernet include low cost, higher bandwidth, synchronization, flexibility, and scalability suitable for the rapidly-changing platforms and emerging car series. The usage of the ethernet is also projected to rise for future technologies such as autonomous vehicles. With the rising adoption rate, the demand for in-vehicle networking technologies is growing at a fast pace, making the viability of automotive ethernet even more evident. The deployment of low-cost ethernet will provide high-end features such as infotainment and ADAS features including lane departure warning and surrounded-view parking, accelerating its demand in the market. The luxury car segment dominates the automotive communication technology market with a market revenue of over USD 4 billion in 2017. The rapidly evolving technology is setting the trend for the adoption of advanced communication technologies in this segment. Over the last decade, various high-end car manufacturers have installed the communication technology in their vehicles, delivering enhanced comfort and safety to their customers with applications such as adaptive cruise control, ADAS, active chassis stability, and infotainment. Advanced communication and connectivity features in these vehicles have enabled manufacturers to reach consumers on an individualized basis thereby strengthening brand loyalty and long-term relationships. This has led to more intense brand and product experience for customers, augmenting the market growth. The OEM segment is projected to hold a higher market share in the market. The customers’ requirements across the geography vary as the needs of customers residing in developed countries are different from those in developing countries. To meet this rapidly growing diverse demand structure, OEMs are adopting communication technologies that provide customers with enhanced safety, security, and internet connectivity. Companies appoint a direct sales force for serving large OEMs by embedding their technological offerings in leading hybrid vehicles. 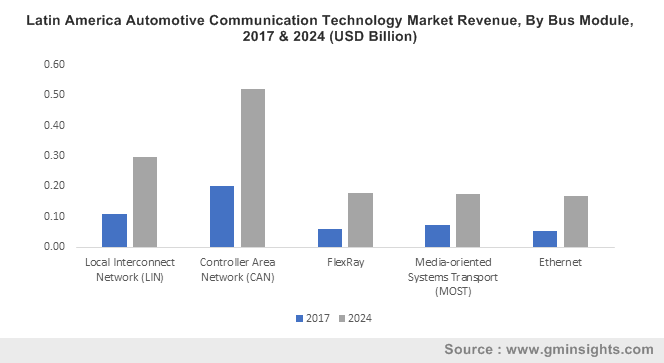 Various companies operating in the automotive communication technology such as Broadcom and STMicroelectronics have established a strong relationship with various OEM customers, driving the market growth. 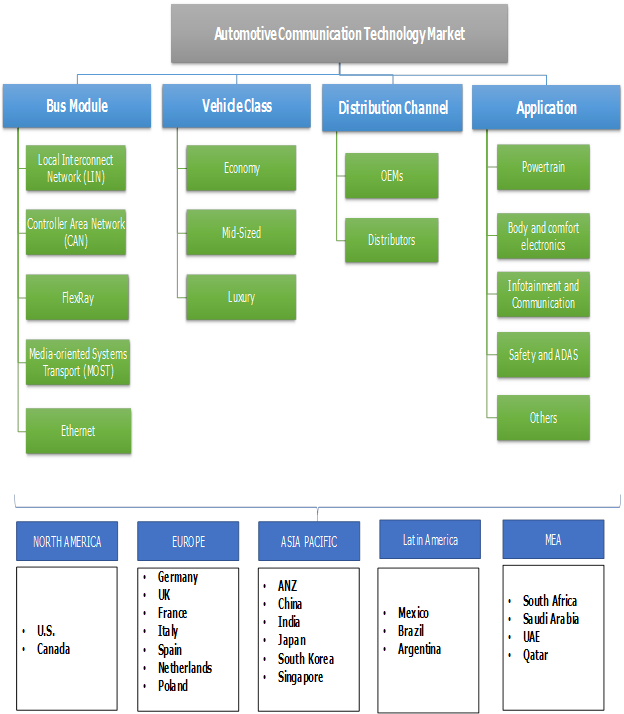 The infotainment & communication application segment is projected to grow at the fastest rate in the automotive communication technology market owing to factors such as the rapidly growing vehicle production, telematics regulations, and the growing demand for safe, luxurious, and smart vehicles. This application provides entertainment and information in the form of video and audio content, social networking, communication, games, navigation capabilities, rear parking assistance, and vehicle diagnostics, creating a higher market demand. This application majorly uses CAN and MOST networks, providing efficient and easy means of communication and enabling the transmission of all forms of infotainment information throughout an automobile. However, with the evolving technology, these protocols are being replaced by the Ethernet as this technology can support the high data rates required by the next-generation infotainment systems along with reduced cabling, cost, and network interfaces. 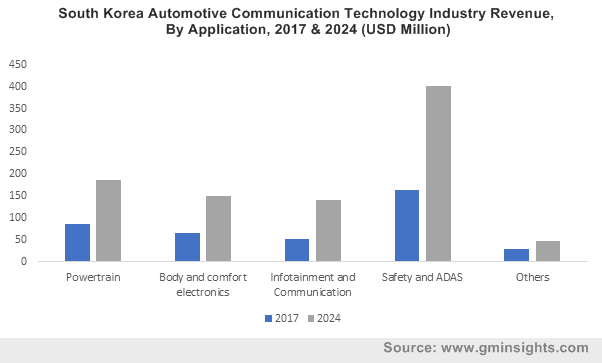 Asia Pacific dominates the automotive communication technology market with the market revenue anticipated to reach over USD 8 billion by 2024. The major factors contributing to the market growth include rapid improvements in communication capabilities, increasing demand for premium cars, rising FDI in the automotive sector, and increased government mandates for reducing CO2 emissions from powertrain systems. China accounts for the largest market revenue in this region with the country witnessing an increase in the car registrations with a corresponding growth in the automotive electronics market in 2017, driving the market growth. North America is projected to grow at the highest rate and is expected to grow at a CAGR of around 18% over the forecast period. Factors such as high standards of living, demand for advanced technologies, and growing government mandates for safe & secure vehicles have led to market growth in this region. The U.S. Environmental Protection Agency (EPA) has established standards for vehicle emissions to improve the air quality. The companies functioning in the global automotive communication technology market are concentrating on entering into strategic alliances with leading semiconductor providers, which provide them important benefits such as sharing of costs, access to additional production capabilities, and sharing of the technical know-how. For instance, in August 2017, NXP Semiconductors partnered with Changan Automobile, a China-based automotive manufacturer. This partnership is aimed at the joint development in the field of technologies and infotainment for future vehicles. The major companies operating in the market are NXP Semiconductors, Robert Bosch, Texas Instruments, Toshiba, Broadcom, STMicroelectronics, Microchip, Qualcomm, Infineon, Continental, Cypress Semiconductor, Xilinx, Rohm Semiconductor, Vector Informatik, and Intel. The growing advancements in the automotive industry have led to an enormous increase in vehicle electronics. An increase in the applications of electronics in the automotive systems can be attributed to the improvements in vehicular designing. The companies have enhanced requirements for providing safer and convenient automotive communication to their customers, which has led to the growth of the automotive communication technology market. The companies are also investing in ongoing process improvements to bring about flexibility and ease-of-usage in the automotive communication technology sector.